A historic find at R.K. Puram, the Wazirpir group of monuments has an amazing step well and manicured gardens, making for the perfect one-day getaway. The Wazipur complex, a congregation from the Lodhi era, consists of old structures located in R.K. Puram Sector–5, and is nestled in an extremely small green space in the midst of the city. It has a beautifully constructed baoli, too, which is a must-see. The iron gate, which is installed to keep out vandals and anti-social elements, is of great historic value, and is mostly kept semi-locked with a chain. 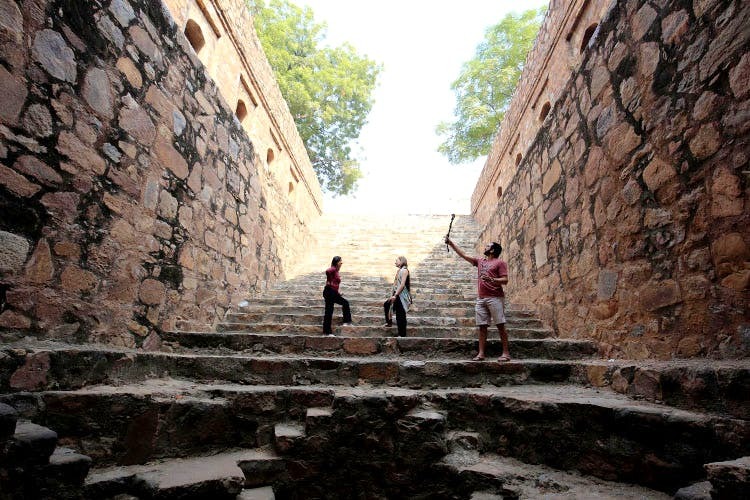 One can first head towards the rubble-built baoli and the smaller qibla, or just climb up the stairs to examine the tomb cluster; the two sets are on either side of the pathway that demarcates the area. Someone who digs history, the Wazipur Monument Complex is a hardly-visited set of forgotten monuments in the center of Delhi. It’s great for someone who enjoys long walks and picnics in the winter sun. The step-well is beautifully constructed; one must walk down and explore it to know what I’m talking about. A great place for a light picnic, with no alcohol of course.